This Chart depicts the Ground Operations Support System for Apollo missions to the moon. 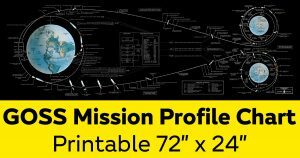 Download Printable: GOSS_Mission_Profile Chart 72" x 24"
Revised with clearer type and now 288 dpi for better clarity! Thanks I put a much better version up tonight.